Named for the nearby Kiyevsky railway station, the station on the Arbatsko-Pokrovskaya Line of the Moscow Metro was opened back in 1953. The station is lavishly decorated in the quasi-baroque style that predominated in the early 1950s. A favourite of Regent Holidays’ general manager, Andrea, this white marbled station is bursting with elaborate artworks, frescoes and mosaics depicting life in Ukraine and soldiers during the October Revolution and the Civil War. Photograph by Antares 610 via Wikipedia. Kiyevskaya station (a different line – Koltsevaya Line). Photograph by Punxutawneyphil, via Wiki Commons. Moscow is an amazing city which should definitely be on the top of your ‘To Visit’ cities; but while many know about the attractions in Moscow, not so many are aware that the Russian capital has some of the most beautiful metro stations in the world. Considered by many the most beautiful metro station not only in Moscow, but in the world, Mayakovskaya is a fine example of pre-World War II Stalinist Architecture. The name as well as the design is a reference to Futurism and its prominent Russian exponent Vladimir Mayakovsky. In fact, the entire station is a triumph of both engineering and art, a part of the brilliant Soviet future envisioned by the poet Mayakovsky. Located 33 meters below the surface, the station was used as an air raid shelter during World War II. Photograph by Andrey Kryuchenko via Wikipedia. 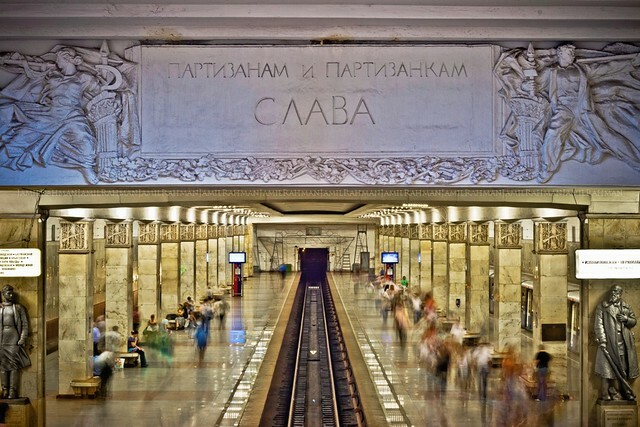 The subway is the brainchild of the tsars, but it was only built by Stalin, whose idea to make the city’s metro stations “palaces for the people” has translated into some truly spectacular, subterranean architectural gems. It’s possible to spend an entire day or more travelling the metro and exploring the vast array of ornate stations. The station, designed by Architect S.Volovich, is a single-vault design of shallow depth. The station is modern, being opened in September 2008. Photograph by Eugeny1988 via Wiki Commons. Of those 195 stations many have interesting architecture and design that reflect the era they were built in. The mix of technology, industry and art is simply breathtaking. This is also one of the more famous stations, being named after Revolution Square, under which it is located. The station opened in 1938 and it features no less than 76 magnificent bronze statues of soldiers, farmers, schoolchildren, workers and a whole host of other characters who helped “defend the Soviet nation”. One of the statues, a dog, is said to bring good luck to those who rub its nose. Image credits: A.Savin, via Wikipedia. Rub the dog’s nose and you’ll have good luck Photo by beggs. The Moscow underground is owned by the state, which is probably one of the reasons why the stations look so lovely. It’s the most busy subway outside of Asia, and also one of the most active – running from 5AM to 1AM, with just 4 hours of downtime. The elevator on the Shabolovskaya station. Though the station itself was built along with the rest of the Kaluzhskaya Line in 1962, problems with the escalator shaft postponed its opening until November 6, 1980. During the 18 intervening years the appearance of the platform was modernized, so it does not appear similar to the other 1960s stations on the line. Photograph by e_chaya. The subway is also one of the most extravagant architectural projects in Moscow – it’s one of the few lavish structures designed for popular use. This is the only Moscow metro station where all passengers board and exit trains in different locations. Image credits: Yuri Degtyarev. But there is also a strong political charge in the Moscow Metro – The Communist Party wanted to finish the project with unprecedented speed, in order to show that a socialist metro could surpass capitalist designs. It was especially important to the Soviet Union that socialism succeed industrially, technologically, and artistically in the 1930s, since capitalism was at a low ebb during the Great Depression. Originally called Botanichesky Sad after the Botanical Garden of Moscow State University which are located nearby, the theme of this station develops the connotation of the name in the overall colour tone. The pylons are faced with flared white marble, and are topped with ceramic bas-relief frieze made of floral elements. Image credits: Mac_steve. In typical communist fashion, skilled engineers and construction workers were scarce, so the unskilled labor had to carry the bulk of the operations. The Metrostroi (the organization responsible for the Metro’s construction) conducted massive recruitment campaigns. Nakhimovsky Prospekt station – one of the simpler stations, but still with a very sleek design. Image via Yuri Degtyarev. In one of several admirable projects, the subway opened a virtual library of Russian classical literature, available to read not only underground, but also on the above ground transportation. The full library service is already online and many of the 2,490 million passengers travelling on the metro each year enjoy its services already. It opened on the first of January in 1950. The end of the central hall once had a large sculptural group Stalin and youth, however this was replaced in 1961 by a new artwork of the same authors (P. Baladin and Ye. Blinova) depicting Vladimir Lenin, Coats of arms of the Soviet Republics and images of Hero-Cities Leningrad, Stalingrad, Sevastopol and Odessa. Photograph by A. Savin, via Wiki Commons. Taganskaya station. Photograph credits: Alexei Troshin, via Wiki Commons. Moscow’s commuters are no strangers to high culture, with previous projects including the installation of miniature art galleries on underground trains. The latest digital aspect is set to coincide with the installation of free wifi on all metro carriages by the end of 2014. The station opened on 11 September 1938. The station is named after the Sokol cooperative settlement (built in the 1920s) that also gave name to the district of Moscow. Image via Yuri Degtyarev. Currently, the Moscow metro is undergoing a major expansion plan, which is set to expand it by almost 150 kilometers in 2012-2020 to 3rd largest metro system after Beijing Metro and Shanghai Metro. Named in honor of Dmitri Mendeleev, the founder of modern chemistry, who established the periodical table of elements, Mendeleevskaya station also has another, sadder story. A stray dog named Malchik lived at the station for about three years. Malchik became a popular station “resident” among rail employees and commuters, and defended his territory against drunks and other dogs. Sadly, Malchik was killed when a 22-year-old woman Yulia Romanova stabbed him with a kitchen knife. Later it was revealed that Romanova has a long history of cruelty to animals and psychiatric treatment. The incident sparked a wave of public outrage regarding the treatment of animals, and, in 2007, a monument was erected in Malchik’s honour at Mendeleyevskaya station. Malchik’s statue can still be seen today at the station. The construction of the station started in the 1990s though soon the station was conserved due to insufficient funding. The construction process resumed only in 2007 and the station became functional in the Summer of 2010. A special station for literary fans, Dostoievskaya is named after the famous author, Fyodor Dostoyevsky, and displays several striking murals depicting scenes from his most famous works such as Crime and Punishment and The Idiot. Photograph by A.Savin via Wiki Commons. Architecturally the station is a tri-vault wall column design with a monolithic concrete plate on the floor. Although it looks very modern, the theme of the station is actually old Russian cities. Photograph credits: VanHelsing.16 via Wiki Commons. The 2005’s rename to “Partizanskaya” has been mentioned in the open letter of a resigning Moscow’s toponymy commission member. Image credits.